Hi, and welcome to Foodie Friday! See my GIVEAWAY right below! This recipe is a REAl keeper! This pork recipe is one my husband keeps asking for! The cream, fennel, bacon, and lemon juice mixed together make a memorable sauce. It's easy to make and would be a great "go to" meal for company. This recipe has been slightly adapted from Michelle the author of the blog "Ya Get What Ya Get." 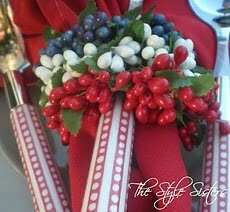 When I saw this on her blog, I new I would be making this soon! This blogger has just given birth to a new little boy! I thank her for this recipe because we will be making this for years! Don't forget to enter my "100 Followers" giveaway for 12 "Style Sisters" napkin rings. Just click on GIVEAWAY or click on the picture of napkin rings in the left hand corner of my blog. The giveaway ends June 11. 4-6 boneless pork chops -- I use pork sirloin. 2 tablespoons fennel seeds chopped and minced--Use dried fennel found in the spice aisle. 1 cup whipping cream --Just straight from the box. Trim fat from meat. Tenderize meat with a meat mallot. In a shallow bowl combine flour and a dash of salt and freshly ground pepper; coat pork with mixture. In a large skillet, cook pork in hot olive oil. When cooked and browned; remove from skillet. In the same skillet, cook bacon until crisp or near crisp. When bacon is cooked, cut into small pieces. You can also leave them in larger pieces like I did. Add fennel, onion, and garlic. Cook a few minutes longer. Add lemon juice, then stir in whipping cream. Bring to slight boil, and return meat to pan. Cook sauce util it has begun to thicken and quickly remove pork and spoon sauce over meat. I am linking up with Michael Lee West for Foodie Friday where you will find lots of great recipes! Joni, you've done it again. This looks like a winner for those invited to your red couch. I will try it soon. Thanks! Hi Joni, is the fennel really strong in this? I'm not a super big fan of it but the recipes sounds different and yummy. Sounds devine...can't wait to try it. I've never had this before. Looks great! Pork and fennel are a wonderful combo! This sounds delicious. This sounds lovely - great for a dinner party! Oh, this looks fantastic! Going throuh the list of ingredients....just need to get the whipping cream! I know what we are having for dinner very soon!! Looks good, can almost smell it cooking.. Can you believe the price of cream??? Unique recipe...I need to print this one out! Sounds delicious. Yum, this sauce sounds delicious and perfect for pork. I love the flavors of fennel and bacon. This is a must try. Anything with two kinds of pork has got to be good, especially when one of them is bacon! Joni! I love how the giveaway looks on your blog. This is going to be so fun! Some lucky winner will love the napkin rings. Joni, I made this tonight and it was one of the best things I've made in a long time. 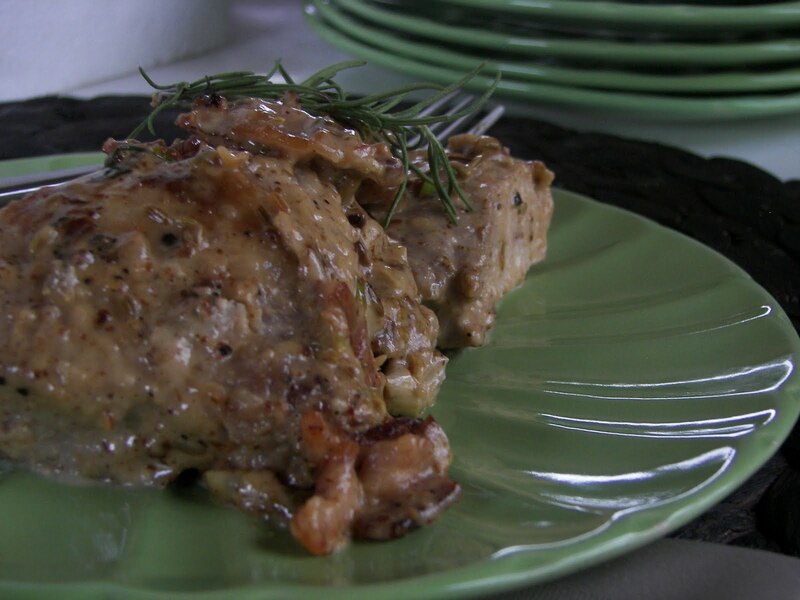 The fennel, garlic, onion, lemon and bacon gave the sauce a lovely flavor. I added a fresh green salad with a cranberry vinaigrette for a perfect meal. Thanks so much for sharing, as I have never made something like this before and love to try new things!